This little one is staying up late, skipping naps and sitting around restless....waiting for her turn to attend a sparkling, crackling, fun-time summer festivity! Do you remember when the Le Petite Elfcup 8" doll pattern was introduced back in February of this year? At that time, I mentioned that the creation of an 8" doll pattern was a way for me to lay the groundwork to move into a jointed design and to start exploring armatures that will allow for standing and posable dolls, yet will still allow me to work within the very small structure that I so enjoy making. As much as I would like to work within the miniature size of the 6" Wee-Bee Mini Elfcup, it turns out that jointed designs for a doll this size is not entirely effective. This, I discovered back in April when I was in the making of the little boy that would fly a gypsy moth. The gypsy moth boy is still my work in progress and though he was not jointed, he was partially armatured. And what I learned was that bendable parts, whether jointed or armatured, on such tiny dolls will yield more bulk protruding than it would yield a nicely posable or simply bendable doll. There can be very complex technical methods involved in doll jointing and the options are endless. In BJDs, a maker can spend months jointing together a doll that has as many as fifteen joints all strung together to create total poseability in the head, shoulders, elbows, arms, hips, knees, legs, ankles, toes and fingers....it's amazing. In more classic dolls the jointing might involve thread joints, sewn joints, disc joints, or simple ball joints. 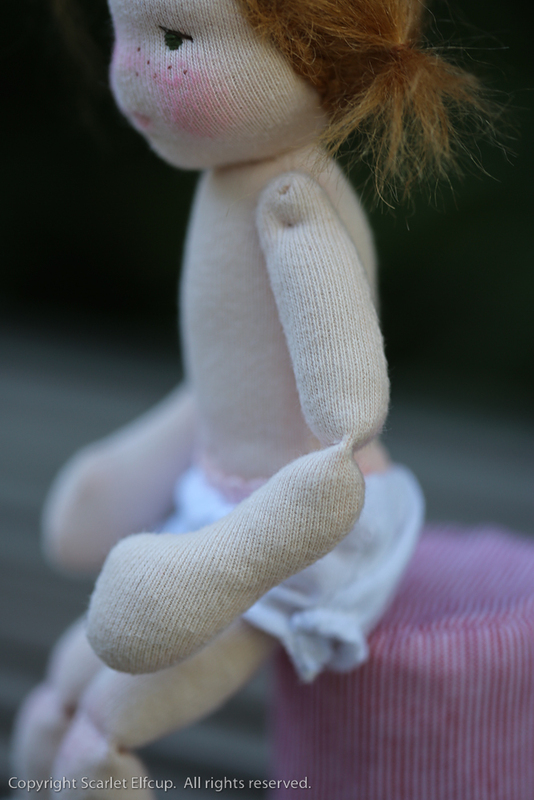 For my first jointed doll, I wanted to stay very basic and to simply see and feel a jointed creation. So here is the most basic and simple jointed doll you can get. This little girl has sewn joints for her elbows and her knees and string joints for her shoulders. Even in the simplicity of these joint designs, she just looks and feels more FUN! Her knees and elbows can bend beyond 90 degrees and her shoulders can rotate above and behind her head. Imagine the fun things that she can do with such flexibility. Stay tuned for upcoming details regarding The Northern Collective upload on July 4th weekend.